MTV/MBC Media Network, owned by controversial businessman Killy Rajamahendran, has come under severe pressure on social media for its “unethical and brazenly uncivilized” coverage of the current political crisis in Sri Lanka. Sirasa, the flagship channel of the network, repeatedly aired breaking news, strongly pushing for the removal of Prime Minister Ranil Wickremesinghe. This attack was carried out in the manner of a hate-campaign, violating all norms, ethics and professional standards adopted by ‘civilized’ media institutions across the world. Colombo Telegraph learns that all this “drama” is initiated and directed by Rajamahendran who holds a grudge against Prime minister Wickremesinghe for refusing to grant national list MP slots for J. Sri Ranga and Susil Kindelpitiya, two of his close allies who failed to enter Parliament through election. Prime Minister Ranil Wickremesighe claimed in public that Rajamahendran attempted to get national list slots for his ex-employees and challenged him to deny the allegation. So far, Rajamahendran, his channel or his allies have failed to respond to this allegation. Instead, they had resorted to a continuous and relentless hate-campaign against Wickremesinghe. Facebook and Twitter, last night, was flooded with posts criticizing and condemning ‘Sirasa’ and its owner Rajamahendran’s agenda. When a group of UNP MPs visited Temple Trees yesterday for a discussion with Prime Minister Wickremesinghe, Sirasa rushed a television crew to broadcast live what they suggested was the imminent fall of the Prime Minister. The group of MPs walked out of the meeting, smiling, and pledged full support to the Prime Minister, causing great embarrassment to Sirasa. When one TV crew member asked an MP about the ‘fate’ of the Prime Minister, the latter quipped, “Ah eka Sirasen thorala apita kiyayi” (Sirasa will decide that and let us know). Rajamahendran, who now appears to be a champion of democracy, was a man who manly bowed down to former President Mahinda Rajapaksa and pandered to the previous government’s political agenda. 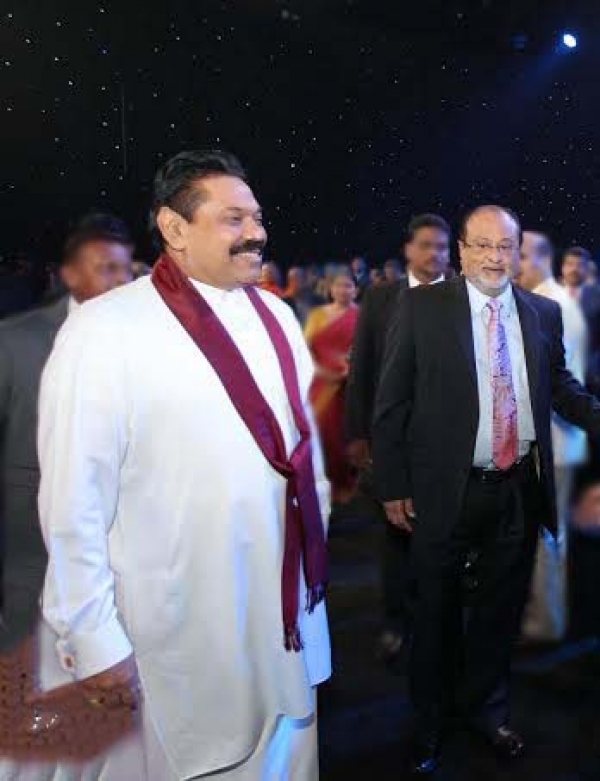 A leaked “CONFIDENTIAL” US diplomatic cable, dated March 22, 2007, updated the Secretary of State on Sri Lanka’s media suppression situation shows that President Mahinda Rajapaksa managed to influence the owner of the Majaraja Broadcasting Company. The Colombo Telegraph found the related leaked cable from the WikiLeaks database. The cable was written by the Ambassador Robert O. Blake. “Television stations have also been feeling the heat. This matters, because about 60% of the population gets its news for TV. Television journalists tell us, however, that the Majaraja Broadcasting Company, owned by a prominent Tamil, had been the only broadcaster covering press conferences criticial of the gvernment by former Foreign Minister Samaraweera, as well as stories on human rights violations and abductions. However, a senior executive of the Maharaja channel (protect) told us that President Rajapaksa had summoned the owner of the station to Temple Trees (equivalent to the White House). During a cordial chat, Rajapaksa was able to persuade Maharajah not to air any more programs on such sensitive topics​,” Blake wrote​. Ranil is a rare politician against whom there are no corruption allegations. He is the man of the hour and fittest to lead the nation. There was no scam. Its only the perception created by politicians and believed by ignorant public who do not have a clue of how the CB raises funds. Why is the AG silent even after the commission report? He does not have a case that he can bring forward. Hey Burt are you for real? P***off you stupid. The money Jarapassa family looted is 99% more than the bond scam. Anyway that money has been recovered, whereas the Jarapassa loot has disappeared. Where to?. overseas. Stop licking the Jarapssa a***s at least now. They didn’t win, 35% did not vote. That’s not enough man; it’s not an excuse to let thieves live without prosecution. Culprits must be caught & dealt with to give maximum punishment. People want GG to deal with culprits of the previous regime too, that’s why GG was formed. If the loot is disappeared it’s also the failure of the govt. Fool, you should know that uncast votes aren’t considered for decision making, except that’s cast vote is very low. like below 20%. It’s you licking the thing you mentioned of RW/MS of probably fake GG..
No comment, as you are a blinkered, ignorant, individual with no common sense. The money looted by the previous regime including the MP for Kurunegala and his wife (Tzunami & Siriliya) which is just a drop of the ocean is enough to send them to jail for life. That was money donated by people with a heart and stealing that is……..no words to explain. Where is all that money…..0000000000001 NI?…….so on. The list is endless. Don’t cause injustice to the nation. Appointing a rouge to the CB? Making that rouge an adviser? Yes, he’s rare because he’s the worst ever to be born in SL. For god’s sake, learn to spell first. Your ignorance invalidates your opinion. Justice, Please wake up !!! Basm, don’t waste your words. This guy is on Lansa’s heavy stuff which Mahinda Jarapssa got involved personally and released to the faithful voter base. He will never wake up in this life. Central Bank scandal or not, the best politician who could bring great dividends to the country is undoubtedly Ranil Wckramasinghe. If he is responsible for appointing Arjun Mahendran, he must say sorry for the blunder and clear his credentials from wrong action. Mother of all sins done by RW is that he appointed RK as the Finance Minister after knowing well his track record. This move was a major blunder by UNP cost them the local government election setback. It is too late for UNP for any revival as Mahinda has already on a victory march. Killy Maharajah is not only Anti-Ranil, he is also Anti-Mahinda. However, Mahinda knows how to ‘kiss the hands that cannot be cut off’ whereas Ranil keeps falling flat on his face by trying to confront him. Irrespective of race/religion, Killy Maharajah had been manipulating the SL politics for many years for his own selfish benefit. His proxies were made MPs (national list) in every government. Ranil not only care two hoots for Killy Maharajah but he also refused to accommodate his proxies in parliament. That is why, Killy Maharajah is trying his very best kick Ranil Out. He has used his media machines to the maximum to make Ranil very unpopular among the masses. He also used the so called ‘scholars’ like Dayan J (paid well) to discredit Ranil calling him an unpatriotic traitor and a bank robber. Even Ranil may not know the conspiracy that is taking place behind his back. This is not the time for him to step down. justice – I concur. Unfortunately, the pulse of the people indicate that our “Tsunami Hora” should lead the nation. I don’t know why, hema wennay aiy?? These sakkiliyas, destroyed entire country. Media men spoke as if they have all informaton at their disposal. But the dogs, never stood a big voice against real culprits. My wish is, MR and clans to be cursed by all mighty gods so that we can have a better srilanka. This man et al have fooled the nation, as if the average would survive on his extrements. How can a nation be guided by the kind of stupid men – Gota returned and held big talks.. hi hi… the most abusive man of the country- … as if he would have been godded by stupid folks. Current leaders could get him by his horns, if they reacted properly. We dont need to wait longer. This is why we have so many TV channels , even Rupavahini one time led by a joke like Hudson Samarasinghe to give different versions. The public can decide what to believe. Let us not worry about the messenger here. Has Ranils’ politics of 40 plus years benefited the UNP or the country ? Has Ranil attempted to establish an old boy and crony cabal as a political value system ? Since Ranil became leader of the UNP has it experienced any success or progress ? How many years has Ranil led the UNP and how many defeats has he suffered in these years ? Did he appoint Arjun Mahendran as Governor ( working for foreign bank like thousands of others)of the Central bank despite his wheeler dealer son in law being a major Bond trader ? Did the Hon PM try to confuse and mislead the country with high jargon like auction system and bidding etc.When Aloysious bought all the bonds was it an auction and who were the other bidders ? Did Hon PM appoint a briefless UNP lawyer( who is depending on government repair jobs for his car repair garage) to investigate this massive fraud. Was that Pitipana Commission made in good faith ? Did Hon PM get the clueless UNP lawyers to become partners in crime by getting them to do foot notes to the Parliamentary report on the bond scam ? Did the Hon PM think that by dividing the SLFP he could win elections and as a part of that strategy block investigations of MR frauds ? Are all these things inventions of Maharaja or are we shooting the messenger ? – The footnotes were clarifications on technical issues which the JVP big heads did not want to be brought into the main COPE report. Incidentally, the Commissioners of the Bond report commends the foot notes in the COPE report and says that they were “factually correct”! Hon. PM did not have to divide the SLFP. Mahinda Rajapaksha did that very well himself, as he realized that his son, Namal will never become PM if he continued to stay in SLFP. Next time, find answers to all those questions which are bothering you. Omg ,I forgot the beetle leaf ,yes any given time the cheapest addiction ,yet can cause dangerous illness . The Trade union should be considered to Tripartism ,the best option for a developing country like ours . should replace the deadly executive Presidential system once and for all. I know I am dreaming ,no politician will be so generous towards us the People . Ultimately they never served us ,its always we who become slaves so they can be kings. But I am deeply grateful to CT as always for permitting me to pen my thoughts ,it gives me some inner peace and am sure those who sincerely put down their thoughts keeping in mind the Country and all the fellow citizens may be feeling the same. Killi, has forgotten fast that his station was attacked and burnt several times by the one time Rajapakse stooge Mervin Silva with the explicit backing of Gota. This news is Greek to me. I don’t watch Sirasa so I don’t know what they air. If anybody thinks that this fellow Killy Maharajah is the man who manipulate Sri Lanka’s politics, the most simple thing to thwart his efforts is to have an island-wide boycott campaign against Sirasa. I’ve no love for the Prime Minister. But it is not the issue here. If Killy Maharajah and Sirasa think that they can manipulate the masses by way of dirty games and rob people’s democratic right to choose/support any political leader, the best thing is to tell people to boycott Sirasa irrespective of party politics. I detest PM’s politics. But he has every right to lead a political party. His fate could only be decided by masses not by TV channels. The Prime Minister is not under obligation to take decisions at the whims and fancies of TV Channel owners. His refusal to accede to Killy Maharajah’s request for national list slots based on the principles of his party, is not a reason for him to be subjected to Killy Maharajah’s unethical media witch-hunt. Such efforts should be denounced. Ok, guys, let’s get together against Sirasa and Killy Maharajah to protect political and civil rights of the citizens of Sri Lanka. Let’s BOYCOTT SIRASA 100%. I believe all print/electronic media will condemn Sirasa’s unethical/uncivilized media witch-hunt against the PM. I am against the PM but I never approve Killy Maharajah misusing his TV Channel Sirasa’s unguarded viewership to take personal revenge against the Prime Minister and manipulate them against him. If people don’t like the PM, they will choose democratic means to ousted him and that is none of Killy Maharajah’s or Sirasa’s bloody business. It is not Sirasa alone, The Thamil Shakthi too condemns everyminute not onlr Ranil but also Sampanthan,Sumenthiran and backs Premachandran and Gajendran Pnnambalam.>Their news presentation is partisan and most of the news readers read news bulletins which the viewers cannot understand. Their so called news reading is real political commentaries with a bias angle..
May I “second” those sentiments? Yep. What Killy Maharajah is doing to the Prime Minister, he could do to any other present or future leader, too. He should be stopped. Let’s spread the word of boycotting Sirasa, MTV and Shakthi for exploiting its viewership by telecasting forced views based on vindictive politics. People have other channels like Hiru and Derana for alternative views as Rupavahini and ITN are supposed to be trumpets of the ruling governments at all times. Changing minds and changing TV channels both are essential for a full transformation of Sri Lankan politics. UNFGG campaigned vigorously against corruption before the 08 January 2015 election but ignored the mandate entrusted to them. The coalition owes to the voters an expose’ of wrong doings. Start by cleaning up the bond issue. This may involve some selfie-nose slashing but is the only way out. Then go for the other wrong-doings. A caution: Lankans can sense fake efforts. Ranil’s political somersault might end up as killer of in Colombo diplomatic world circle too. People are against him. A section of the Media is using this opportunity. Now, because of his extra-ordinary attachment to China, Diplomats may seek this opportunity sidestep him. While never China or Russia was attached to him, but now West and India are also disillusioned by him. Were there any premonitions in the Lankawe sky horizon, recently like eclipses, comets..etc.? All are crooks none is pure and clean so what public should do is to think twice ….change the system..
You can change the system, you can change the laws but you cannot change the mentality of people. This is a Sinhala Bauda state and its is royally screwed. If one truly analyzes the recent local government election results one will see that the voters are upset that they did not see the Yahapalana Government not delivering what they promised to deliver. When I think further why the Government did not deliver what it promised, I identify one of the reasons among many others, which most of the media have failed to bring forward, is the disruption created by Mahinda supporting SLFP members and the so called Joint Opposition members. Joint Opposition especially and some of the Mahinda supporting Maithree SLFP members have not allowed the UNP to do what they have to do. Further I also note that the President himself has not been honest in delivering what he promised when he was elected. I think our Politicians have not matured to truly understanding their own motto “Yahapalanaya”. Every one is playing “Politics”. This has to change. One of the ways this can change is for the Speaker to commence live telecast of all Parliamentary Sessions and Committee Sessions so that the voters can see who are the honest and dishonest politicians are. Park, you are right.Sirisena promised to open the road in front of the Temple at kandy, but did not do so.It had caused a lot of health problems to the people of Kandy. I think the worst affected are he school going children.Ambulances cannot get to hospital without delay because of this.There are Christian, tamil schools and a big Muslim mpopulation. Is that why the Asgiriya man, known to be racist minded wants to keep this road closed? Sirisena has proved once again that his word cannot be trusted even for 24 hours. He agreed with the PM to form a UNP Government, next minute he gets a letter from those who lost badly and signed by those who were kicked out of the Parliament and came back due to “Pinata Seat”, again he changed his mind and want SLFP to form a Government. Do we need a President who is not mentally STABLE? Sri Lanka is a country which can develop only through foreign investment, will any overseas business invest even a Dollar in a country where the President is so fickle minded, like the one that jumps from one branch to another? We are no friend or fan of any SL politician, all of them are dirty and corrupt. But long ago, all in our circles stopped watching local channels – especially Sirasa and MTV -, and reading the dailies for they are one sided, and not giving the fair facts but proper-gating the views, opinions and desires of their owners for their ulterior gains. Now we gone to the cyberspace like CT which are fair and balanced to all. For the owners of these institutions and their journalists, instead of earning in this dirty ways to making living to feed their families, it’s rather good for them to work as prostitutes – male as male prostitutes, female as female prostitutes.This is the oldest profession in the world and more dignified for all of them, and fits and suits them well. Even in the recent Satana program it was shameful to see Ranga not listening to his own Anchor. It is not ethical for Sirasa to have Ranga, the traitor who was a UNP supporter during the day and at night who was going behind Mahinda as a media person. How can Sirasa have a Mahinda supporter, who is not a neutral person as a media person posting questions? All the questions of Ranga are directed at attacking UNP and PM. Sirasa is going down every day. Maharaja is mad with PM as PM does not do what Killi wants and he is taking the revenge. As for Ranga, I fear that you are attacking the puppet instead of the puppeteer. Whether Ranil deserved what he got from the Empire for his failed deals with the Emperor, what the Empire did from early this century to him and the UNP was disgusting. Its loyal pawns have failed to get very far despite all the media backing. This is the Emperor’s last big chance. Will he let it go? I doubt. You will agree, I guess. The media lunatics must not govern the country. If his (Sirasa) conduct is unethical and illegal, then cancel the license. The peoples power shall be above all. Maharaja Group is helping SLFP/SLPP this time. Similar ly last time UNP had HArry Jayawardane and the man who was caught in a Bank – money scandle again not paying the clients and investing that money overseas and wife spending in overseas trip. This time Ranil and the other UNP thieves who were caught and it was exposed by Maharaja. Now it is itching to elephants gasping for breath. I heard Ranil is not a saint who di dnot steal a penny. He had sons and daughters I do not from whom and he supports them. Killi is a born loser. Since Premedasa Snr all his bets have lost. He tried to make Chevaan Daniel some sort of big shot. Ranil is still batting on. Killi the born loser? Living in the lap of luxury? Are we playing silly buggers here? We all knew well the propaganda behind all Maharaja Media network of the recent past carrying on their so called social responsibility ” GAMMADDA ” and other mud sliding efforts to tarnish the image of PM Ranil Wickramasinghe and bring Sajith Premadasa to the UNP leadership. Most horrible showoff we saw on the day before proving how nasty this media tycoon is. The way so called media professionals ( bones eating hired foxes ) barked against Ranil was a shame. They were talking nuisance. Media of this country doing politics. They try to appoint leaders and expel leaders of this country. High time public to get rally against these corrupted media institutions in the country. I am not for anyone here. But the conduct of Sirasa/MTV has been deplorable. Its an insult to any person’s intelligence to watch the garbage that is thrown out for our consumption. Kindepitiya is always a easy buy and Ranga is a dirtierst of all journalist covered with lies, deceipts and twists and both plays according to Killy’s melody. Whata shame. Ranil is not a shroud or a thug like Rajapakses or otherwise Killy always abide with orders from Gota in those dark, bygone bloody days of Mahinda. Shame on MTV and Killy and Sirasa!!!! Ranil is not a thug? You are kidding me. Remember Batalanda Torture camp. RW not only a thug, he is the biggest traitor, remember what happened to all intelligence officers during his PM shop in 2004? Remember him giving away the EAST and The North to Praha karanna? Them comes the biggest CB robbery worm Arjun. Who appointed Arjun? Who appointed RAVI K? RW must go for the benifit of our country and UNP. By the way I am not a Jara passa fab at all, I hate that clan too. Raja Mahendran is a SHAMELESS, SPINELESS man who is resorting to this mean and despicable act tarnishing the name of his media institutions and nullifying the service done by them, merely for political reasons. If he is so desperate of having political representation certain he can field some candidates as independents and throw the billions he can to see them win instead of stooping so low like he does!!! If Lankaenews could be banned why not Sirasa/MBC networks. Its is best to boycott all Maharaja Products. Sillysena is behind all this kumanthranaya through proxy channel Sirasa. What a shame getting 12%. and falling into fourth place. Sanka is another idiot who propagates false news. The other joker is the fatso who conducts Pathikada. I always wondered why none of the political parties or even an individual has not filed a case against these anchors for propagating FAKE NEWS in a court of law? Killi means Parrot in English Killi’s are normally Kept in cages in homes. When they are let loose they go on ‘Talking”. Some of the talks are interesting, some dull and some meaningless. So is News1st/Sirasa/Shakthi. Nevertheless we must give the devil (Killi) its due merits. If not for them All corruptions including murders would have been swept under the carpet by all politicians..
As one commentator pointed out the Thamil Shakthi tv carries out a relentless campaign of misinformation and vilification against TNA stalwarts like Sampanthan and Sumenthiran. The anchor of Shakti tv is an uneducated imbecile but he poses off as a political pundit. You must watch him how he massages facts and downplays the views contrary to his liking. I am glad to know here Ramil Wickremesinghe refused to nominate the cronies of Kili Maharaja. They should have been charged for influence peddling and interference in the affairs of the state. By the way he contested the last 2015 parliamentary election and lost his deposit. They all know only Ranil can take the country toward s prosperity. MR and sirisena wants to stop that. If Ranil develops the country, others can’t get votes. People of this country doesn’t know the value of ranil. He is honest, knowledgeable, dedicated, I suggest to make ranil president for only one term. Only he can make our country a Singapore. The four “black coated Kevattaoyos” in SirasaTV make themselves jokers showing the world that they carry on with an agenda. Sirasa tv boasts that they are a responsible media organization. Nonesense. Rajamahendran is a terrorist who gave money to LTTE to carry on a war against SL government. Rajamahendran should be despatched to Jaffna along with the four backboneless Kevattoyos Gayan Kalu Thadiya, Chamika Thattaya, Suranga Kiri Baba & sevala Sripaal.